HÀ NỘI — More plastic dustbins to discard items like empty bottles or pesticide packages should be installed along vegetable gardens in Hà Nội’s Long Biên District, local authorities have said. 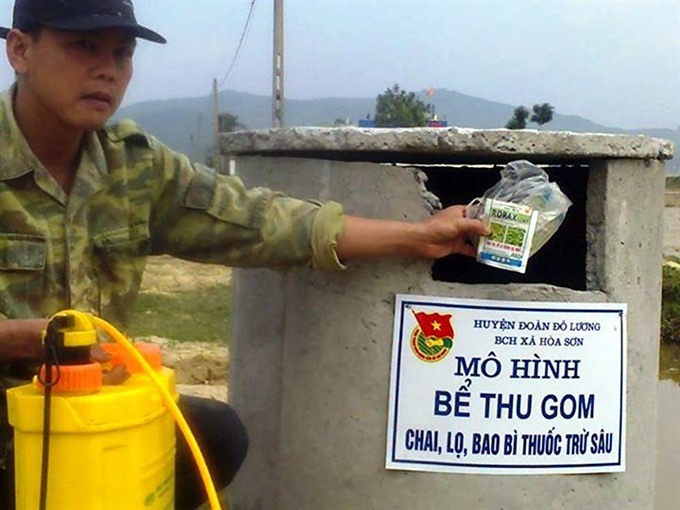 Lê Văn An, chairman of Cự Khối Ward’s Farmers Association, said that installing plastic dustbins over the past five years has significantly raised local farmers’ awareness of environmental protection and reduced the pollution caused by agricultural cultivation. Boasting 180 hectares of clean vegetables and fruits, Cự Khối is one of the city’s key agricultural cultivation areas. There, empty bottles and plastic packages are often dumped near vegetable gardens or in canals nearby. Although local authorities installed large warning posters to stop the behavior, it did little to improve situation, he added. Fearing that the substance remaining in the bottles or packages could pollute local water sources and affect people’s health, the local authority installed 60 plastic garbage bins along vegetable fields in 2012 with aims of creating the habit of proper garbage disposal. The effort has been proved to be effective. Cự Khối Ward farmer, Nguyễn Hoài Nam, said that he began to collect empty bottles and chemical packages and threw them into the dustbin next to his field. He admitted that he, as well as other farmers, used to litter them on the field, as there were no place to dump them. Plastic waste was everywhere. But thanks to the bins, things have gradually changed, he said. Ngô Văn Nam, chairman of Cự Khối Ward’s People’s Committee said the installation of dustbins had contributed to set up the green and sustainable agriculture in the ward. Each year, the ward discharges between 600 and 700 kilogrammes of empty bottles and packages of plant protection substances. The committee hired an environmental company to collect and destroy them properly. Director of the Ministry of Agriculture and Rural Development’s Plant Protection Department, Hoàng Trung, said that the plant protection substances could exist durably and persistently in biological environment and are easily absorbed into the air, water source and land, causing harm to people’s health. However, some localities did not pay much attention to the work. Statistics from the ministry show that Việt Nam imported around 100,000 tonnes of pesticides/herbicides and their ingredients at a total cost of US$700,000 annually. Nam said, a lack of sufficient dustbins causes littering to still occur.